What a Pain in the Plantar!!! Home › Resources › What a Pain in the Plantar!!! Plantar Fasciitis can ground you with heel pain. Let Fit For Life Physical Therapy help keep you running on the ground, road, treadmill, trail, wherever. Plantar Fasciitis – after knee injuries, it is the second most common injury in runners. What exactly is plantar fasciitis? 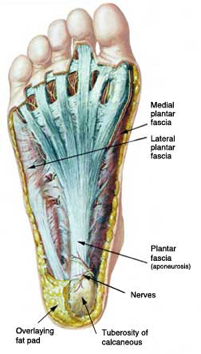 It’s the inflammation of the plantar fascia, the thick tendon on the underside of the foot. 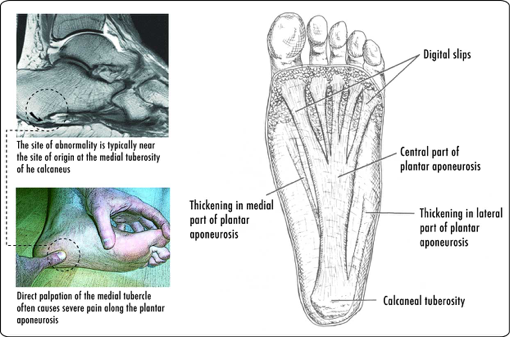 This tendon attaches at the bottom of the heel (calcaneus) and runs to the base of the toes. Pain from plantar fasciitis may begin in the arch of the foot and may progress toward the heel. The inflammation is commonly at the medial tubercle (inside of foot…see picture) of the calcaneus where the medial portion of the fascia attaches to the bone. What are your risk factors for getting plantar fasciitis? ◦ Decreased great toe (the big one) extension…or its ability to bend backwards, such as during push-off from the toes when running. What can I do to prevent or treat the beginning signs of plantar fasciitis? These recommendations reflect some of the basics about this injury. As always, seek medical advice should you be experiencing painful symptoms. Feel free to email us at: Info@FitForLifePhysicalTherapy.com with questions or comments. Fit For Life Physical Therapy is proud to be the Fleet Feet + FrontRunner in-house physical therapy provider. We are here to keep you walking or running on the road, trail, or treadmill. For injury prevention, we provide an educational articles like this and a bi-weekly education series on Saturday mornings at the MIT Training Runs.